Breathtakingly disruptive technologies offer unparalleled and innovative possibilities for naval operating concepts, but a large, survivable hull in the water that is able to conduct sustained combat operations will continue to define the capital ship into the 21st century. Today, a confluence of events has made revisiting the Sea Control Ship a vital task for the sea services. From commissioning new, large-deck amphibious assault ships specifically designed to maximize aircraft operations, expanding ARG-MEU mission sets via the tiltrotor MV-22 Osprey, and most significantly the imminent deployment of the F-35B Joint Strike Fighter (JSF), such a ship with its vertical/short take-off and landing (V/STOL) aircraft and anti-submarine warfare (ASW) helicopters could conduct ASW and carry out other sea control missions such as surface warfare (SUW). Additionally its air group of F-35B aircraft could conduct strike missions in lower intensity conflict situations such as the U.S. in Libya in 2011. Such a platform is the key to the future of maritime warfare not because it is a replacement for the conventional takeoff and landing (CTOL) aircraft carrier, but rather because it is a complement that will free up the larger and all too few fleet nuclear powered aircraft carriers to focus on the power projection mission of striking enemy targets inland during a high intensity conflict. Naval Doctrine Publication 1 (NDP 1) and Joint Pub 3-32 define sea control as one of the core capabilities of naval forces – necessary to the accomplishment of all other naval missions and complementary to the mission of power projection. Sea control operations include destruction of enemy naval forces, suppression of enemy sea commerce, protection of vital sea lanes, and establishment of local military superiority in areas of naval operations.1 During his tenure as Chief of Naval Operations, Admiral “Bud” Zumwalt advocated a High-Low mix of warship designs in order to affordably meet the numbers of ships required to counter the Soviet Union in any major war – specifically the building of smaller aircraft carriers to supplement the Carrier Strike Groups. In 1971, USS Guam (LPH-9) was selected as the test ship for a Sea Control Ship (SCS) concept. Testing began in 1972 and was completed in July 1974.2 Ultimately, the tests and concept were deemed unsuccessful and the Navy did not go forward with it. The short endurance and limited payload of the early model Harrier and the limited sensor capability of both the ship and the SH-3 Sea King ASW helicopter were the chief shortcomings of the concept. However, today such shortfalls would be remedied by the fielding the LHD/LHA (which has a sensor and communications suite comparably to a Nimitz class aircraft carrier), F-35B JSF, the sensor-rich MH-60 multi-role helicopter, and the MV-22 Osprey with its myriad capabilities. Today’s Sea Control Ship could be based on the America-class already in production. At more than 44,000 and 42,000 tons of displacement respectively, the America-class amphibious ships and their LHD half-sisters of the Wasp-class are far from small. The Wasp and America-class ships are over 840 feet in overall length and both types have a 106 foot beam.3 In dimensions and displacement they are akin to, and actually exceed, the war-winning Essex-class aircraft carriers that the U.S. Navy employed to fight across the Pacific to victory in the Second World War. 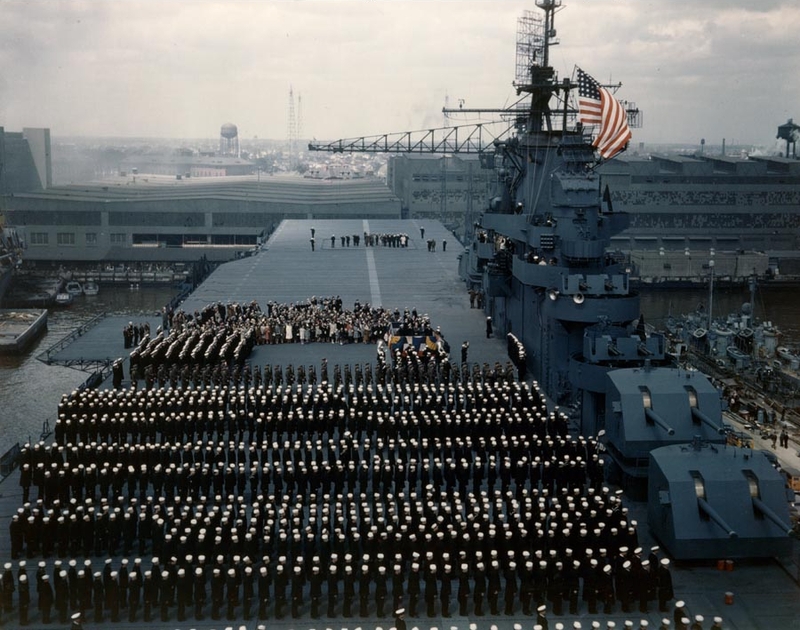 The Essex-class aircraft carriers were 872 feet overall with a 93 foot beam and displaced 27,100 tons in their WWII configuration.4 Coincidentally, the Wasp and America classes also bear more than a passing physical resemblance to these carriers as well. With some modifications, such as shifting the island superstructure outboard supported by a sponson, the flight deck area could be enlarged. Since a Sea Control Ship would only embark vertical/short take-off and landing (V/STOL) and short takeoff/vertical landing (STOVL) aircraft, the catapults or arresting gear systems necessary for a conventional take-off and landing aircraft carrier would not be required. That saves weight, reduces costs – both construction and operating costs – and does not require as large a ship. The chief argument often made in defense of big carriers versus small ones is that anything less than the supercarrier is not survivable – be it the Nimitz class of today, weighing in at 100,000 tons, or the earlier Kitty Hawk and Forrestal classes which ranged between 65,000 and 80,000 tons during their careers. However ,the combat record of the Essex class, which can be viewed as a surrogate for the LHA/LHD (and by extension the Sea Control Ship) in this argument, proves just the opposite. In World War II, not a single Essex class aircraft carrier was lost though several took punishing damage from aerial bombs and kamikazes. USS Bunker Hill (CV-17) was hit in quick succession by two kamikazes while covering the Okinawa landings, experiencing widespread fires and 653 casualties.5 The ship steamed back to the United States for repairs under her own power. In March of 1945, USS Franklin (CV-13) became the most heavily damaged United States aircraft carrier to survive the war after a Japanese air attack inflicted extensive damage to the flight deck, hangar deck, two decks below them, and the CIC, resulting in 724 killed and 265 wounded.6 In post-WWII service, off Vietnam in the Gulf of Tonkin, Essex-class carrier USS Oriskany experienced extensive fire damage through five decks with 44 killed when a flare inadvertently ignited and set off a chain reaction of explosions.7 Ample evidence exists that an aircraft carrier of 40,000 tons or so can take hits and survive. Another argument used against small aircraft carriers, and the adjective small here is used relatively, is that the embarked air component would be correspondingly small as well. This is true in part, but with precision guided munitions (PGM) and the types of missions envisioned for the Sea Control Ship, an air group of 30 or so STOVL fixed wing and rotary wing/tiltrotor aircraft would be appropriate and sufficient for mission execution. Both the LHA and LHD class ships are designed to support an air component of over 30 fixed and rotary wing aircraft. Both ships are also able to accommodate more than 20 fixed wing STOVL aircraft as an alternative load out. During Operation Desert Storm in 1991, USS Nassau performed in this role of “Harrier carrier” and USS Bataan (LHD-4) served in this capacity as well during the opening stages of Operation Iraqi Freedom in 2013. The LHD and LHA of today are not your grandfather’s amphibs. The command, control, computer, communication, combat systems and intelligence (C5I) capabilities are extensive and second only to a Nimitz class nuclear-powered aircraft carrier (CVN) in capability, to include: two- and three-dimensional air search radars, an extensive satellite communication suite, and intelligence support facilities. The sensor and communication assets built into the big deck amphibious ships provide further proof that sufficient capability can be built into a carrier of 40,000 to 45,000 tons. 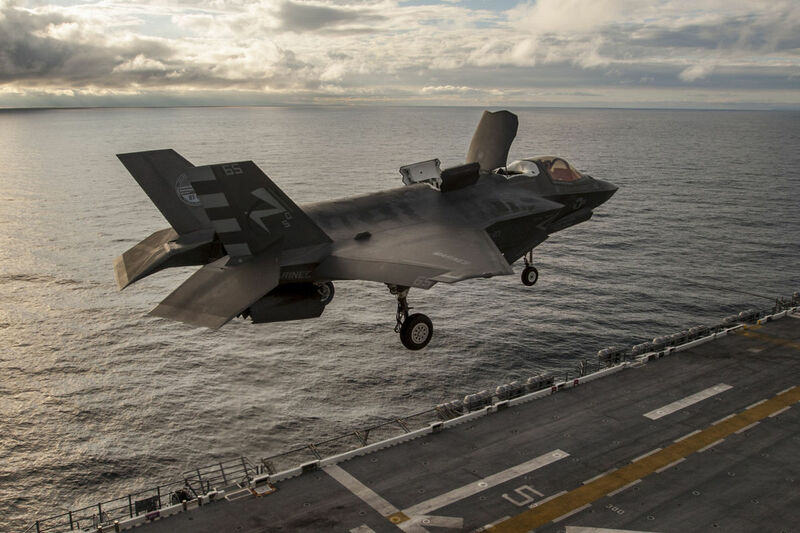 The Sea Control Ship’s air group would be built around the F-35B STOVL Joint Strike Fighter. With its advanced capabilities in sensing, stealth and weapons delivery, this aircraft is a game changer that puts to rest the argument that STVOL aircraft are a step down in capability vis-à-vis their CTOL aircraft relatives. Tiltrotor and rotary wing aircraft such as the MH-60R Seahawks and the MV-22 Osprey would support the F-35B. A tanker mission package is already being developed and tested by the United States Marine Corps for the MV-22 Osprey to further support the F-35B . Additional support would exist in the form of a tiltrotor airborne early warning (AEW) aircraft. For the sea control mission, the main battery would exist in the form of an ASW-tiltrotor aircraft equipped with surface search radar, dipping sonar, sonobuoys, magnetic anomaly detection (MAD) gear and torpedoes. This aircraft would also be capable of surface warfare (SUW) missions if equipped with anti-ship cruise missiles. The MV-22 airframe, combined with technology and systems already in existence, make these variants well within the realm of feasibility and affordability. Rounding out the air group in the mission of sea control would be detachments of “Romeo” and “Sierra” models of the ubiquitous H-60 helicopter for use in the inner zone ASW/SUW mission set. A key advantage of an air group comprised exclusively of STOVL and rotary wing aircraft is the tactical flexibility in basing that they permit. Not only would the air group be able to be based on smaller aircraft carriers and big-deck amphibious ships, but they can also be based in detachments across a number of even smaller ships, to include non-traditional ones such as modified container ships in a further expression of distributed lethality. Additionally, the air group could be shore-based on expeditionary air strips in austere locations. With this capability the air group could conduct shuttle missions between their sea control ship home base and these expeditionary sites. Vulnerability to this type of shuttle bombing operation was always a concern by Admiral Nimitz and his commanders when planning operations against the Imperial Japanese Navy and its network of island bases and mobile striking fleets. It is a vulnerability we can impose on a future adversary in a theater of operations where the geography features many islands. In a major combat/high intensity conflict, CTOL aircraft carriers like the Nimitz class will be fully engaged in strike-oriented power projection missions and seeing to their own fleet defense. However, the supporting missions of sea control will still need to be accomplished and will require a significant amount of air support. Enter the Sea Control Ship. Sanitization of chokepoints to allow the passage of shipping and the protection of convoys are two examples of missions for the SCS. Much like the Independence-class light aircraft carriers (CVL) that supplemented the Essex-class aircraft carriers in World War Two, Sea Control Ships could be employed to provide ASW, SUW, and assist in air defense of the carrier strike group, acting as a force multiplier to maximize the offensive punch of the CTOL carriers. In lower intensity conflicts and small scale interventions, the Sea Control Ship and its air group may be a sufficient instrument of national power to accomplish the mission. Two recent examples of intervention operations bear this out: the employment of Kearsarge Amphibious Ready Group (ARG)/26th Marine Expeditionary Unit (MEU) in Operation ODYSSEY DAWN in 2011 and Wasp ARG/22nd MEU in Operation ODYSSEY LIGHTNING in 2016. Opponents of the Sea Control Ship will correctly state that smaller aircraft carriers lack the sortie generation rate of the CTOL carriers and STOVL aircraft and don’t match CTOL aircraft in range, ordnance load out, and ordnance bring-back capability. However, for the missions envisioned and with employment of PGMs, the SCS and its STOVL air group do not need to exactly match the CTOL carrier and its air wing in these performance metrics. Additionally, the STOVL F-35B comes quite close to CTOL high-end tactical aircraft in performance and outclasses almost anything our potential adversaries currently field. The last decade has been described as budget-constrained and an opportunity for experimentation and innovation similar to the interwar period of the 1930s. As such, the United States Navy and Marine Corps should seize the opportunity to experiment with the Sea Control Ship concept. In this lean budget climate, it is especially appealing that nothing further need be designed or purchased to pursue this experiment. A point to consider is whether, and for how much longer, the appetite for the purchase of nuclear-powered supercarriers will exist in Washington. Developing a lower cost alternative now rather than later that can supplement the CVNs would maximize the utility of the existing carrier fleet. The LHA-6, F-35B, MV-22 and MH-60 series are all in service. Now is the time to use these assets to develop and refine the concepts of operation and employment for a future Sea Control Ship. The Navy and Marine Corps should conduct a robust and iterative series of experiments and exercises to fully develop the concept of operations and employment and then use the results to develop a design for a purpose-built Sea Control Ship class. The America-class would be an obvious and appropriate starting point for this design. The AEW and ASW tiltrotor variants could be fielded in a fairly rapid fashion accordingly using existing off-the-shelf technology. Much like during Admiral Zumwalt’s era, we are once again in an era of constrained budgets and rising international threats. Then, like now, innovative thinking needs to be applied to affordably generate the necessary numbers of ships and aircraft to meet the threat and accomplish the mission. The Sea Control Ship is easy to implement, as flexible as it gets, and requires very little research and development. It is the immediate solution to the Navy’s future needs. Captain Pagano is a retired surface warfare officer who commanded the Kearsarge Amphibious Ready Group as Commodore of Amphibious Squadron Four. Prior to that, he was commanding officer of USS Carr (FFG-52). Currently he is employed as a senior analyst and instructor at Tactical Training Group Atlantic. The idea of a Sea control ship is great but that all hinges on if they can make the F-35B workable. Which is why the X-32 would have been a better back up as well. I suspect building a tilt-rotor AEW platform would be difficult to impossible. Those rotors take up a lot of real estate. A blimp would be a more realistic option…but you wind up with a ceiling around 10,000 ft. Better than nothing, but significantly less radar horizon than an E-2. Not to mention speed, range, endurance, operating ceiling would severely limit the V-22 as an AEW platform. Could the solution be a long endurance UAV. ASW would be problematic with MH-60s. It was probably an acceptable risk to retire the S-3s. But with the emergence of China and return of Russia as a rival I am of the belief that carriers need a more robust ASW capability. Or has the nature of threat changed? 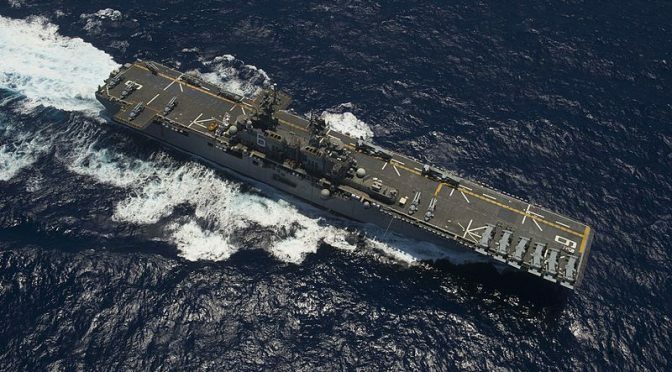 The author makes a reasonable convincing case that big-deck amphibious assault ships (LHAs and LHDs) can operate Navy aircraft in a sea control and limited strike role, but that is already known. Beyond that, most of the article was wasted on strawman arguments and concepts with either thin or erroneous foundations. Survivability isn’t really an argument, and the prewar-designed Essex-class carriers are a rather poor comparison to modern vessels designed after the Forrestal Fire and other serious casualties. Any big warship we build can take a hit, and a well-trained crew can return the vessel to the fight quickly. The most important difference between a small carrier like the French Charles de Gaulle (42,000t) and a Nimitz-class (100,000t) is the extra space on the flight deck, which drives sortie generation; in the hangar bay, which allows complex maintenance; and magazines/storerooms, which extends on-station time. STOVL aircraft make small straight-deck carriers viable, but they all take a significant penalty compared to CTOL aircraft. While using amphibious assault ships for sea control is worthwhile, and I’d support the production of amphibs above the USMC’s sealift requirement for that purpose, those ships can return to carrying Marines as needed. Converting an LHA design to a effective light carrier would require incredible redesign, defeating cost-effectiveness, and a purpose-built SCS would only be useful in theaters too small to warrant a CVN and too far from friendly land bases for the USAF. A CATOBAR CV-41 sized carrier makes sense if it was cost effective. Unlike LHA/LHDs it could carry Growlers and E-2s. An amphib based SCS wounded be limited to relatively benign environments – or scenarios where there was ample land based power. If the latter is the case then I don’t see where the SCS is an critical capability vs a nice to have. Glad to see that my time on USS Guam, ’72-’75, as the Interim Sea Control Ship has proven worthwhile. When I read that the program was sold to Spain, I was disheartened, to put it mildly.